Ken Newcomb, Jr, President and Co-Manager of F.C. Tucker Commercial, has been active in the commercial, industrial and development business since 1975. After attending Indiana State University and Indiana University, he began an entrepreneurial endeavor and was owner and operator of his own business for 20 years. Ken joined F.C. Tucker Commercial in 2000. 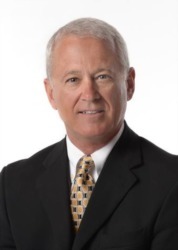 Ken has remained an active leader in his industry, serving as the Past President of the Indiana Commercial Board of REALTORS®, and is a member of the Indiana and National Association of REALTORS®. He has served on the Indiana Association of REALTORS® Economic Development Advisory Board, the Indiana Commercial Board of REALTORS® Professional Standards Committee and is a member of the Evansville Industrial Foundation. Ken was named the Indiana Commercial REALTOR® of the Year and was inducted into the Midwest Real Estate Hall of Fame. Ken has been featured in numerous local publications as an expert in commercial real estate. Deep Market Knowledge – With nearly 40 years in the commercial real estate business, Ken’s depth of knowledge is unmatched. He devotes tremendous energy to tracking market changes and trends, ensuring he is well suited to represent his clients. Superior Negotiation Skills – Negotiation is an art. After successfully closing countless transactions throughout Ken’s outstanding career, he has mastered the art of negotiation. With his extensive experience, you can rest assured that he will work tirelessly to negotiate the best deal for you. Interest in Community Development - Ken continues to work extensively on community projects to promote positive growth in our area. Notably, he was active in the Casino Project, development of the Ford Center and IU Medical School projects downtown. Most importantly, Ken’s clients would tell you that he has a keen ability to bring together multiple parties to create unique, win-win solutions for all involved. Talk to Ken Newcomb today and let him handle all of your commercial real estate needs.